Walking Shollenberger Park is a great way to spend a sunny morning (or lunchtime, or afternoon). I’ve made the two-mile loop many times and am always amazed that this place exists. It is only five minutes from my house but is such an unexpectedly serene escape from urban life. 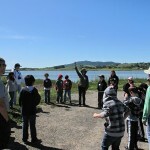 Last week I had the opportunity to join one of the docent-led school groups that visit the park to learn about wildlife. With the help of knowledgeable docents and a pair of binoculars I was able to experience Shollenberger Park in a whole new way. Arriving at the park at 8:30 on a Friday morning I didn’t expect to see so much activity. There was a steady flow of people heading in and out of the trails: running, walking their dogs, pushing strollers. About 400 people visit the park per day. But, it was still quiet and I could hear melodious chirps, squawks, peeps and tweets from all of the birdlife. I met the docent group at the picnic tables just inside the gate. These volunteers lead third-grade classes on tours four days a week, during the fall and spring. They are dedicated and enthusiastic. The lead docent, Nora Pearl said “Every time is a brand new excitement”. The wildlife changes with the season, young birds change plumage as they get older, there is always something different to enjoy. When the students arrived we were divided into groups. I headed off with the bird walk group and in only a few steps we spotted a black-necked stilt, then a flurry of red-wing black birds. A large white mute swan nested along the edge of the pond. 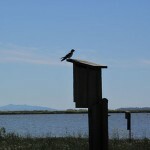 Tree swallows fluttered around the twenty bird boxes that have been erected (by the volunteer docents) to monitor their breeding productivity. 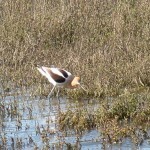 Then we spotted an American avocet, a diving ruddy duck, a great egret, and the list goes on. Nine turkey vultures swirled in the sky. 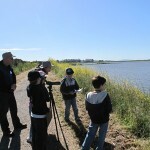 The kids were engaged, binoculars in hand, checking off their list of birds and evaluating the different habits. 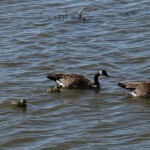 In the hour that I usually took to walk the trail loop we had only gone a short distance but there was so much to see. 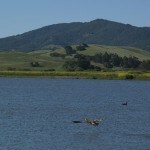 The park boasts almost 200 varieties of birds. 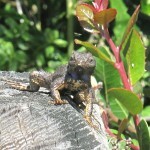 Then the groups switched and I was off on a habitat walk learning about the fresh water channels and the brackish pond, looking for lizards sunning themselves on fence posts, and spotting turtles resting in the cattails. In only a couple of hours my appreciation for Shollenberger Park had grown so much. I will never be able to go to the park for just a walk. It will be too tempting to stop and look for everything I have been missing. I’ve heard Shollenberger Park referred to as “just a dredge spoils site” but anyone who has spent time enjoying this park knows differently. The docents provide tours to the public three Saturdays a month. Take one! 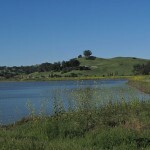 Visit the Petaluma Wetlands Alliance at www.petalumawetlands.org for details. Thank you to the park docents for sharing your wildlife wisdom with me, especially Bob Dyer who provided the facts I have included above, and Nora Pearl who coordinated my visit on Friday. What a great snapshot of this great community resource. That’s what I’m talking about when I say that an asphalt plant doesn’t belong next to a sensitive ecosystem.This is an open air classroom for Petaluma’s kids. All this is available to our citizens for FREE. Talk about pulling together in difficult times – and take a lesson from the birds: let’s build our nest (preserve our Shollenberger park ) in which to teach the young about the natural world.